Chinese food is having a moment in Madrid, and I love it! 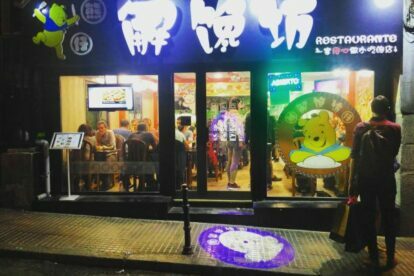 If like me you enjoy the real deal, try “El Winnie”, as it has been baptised by locals because pictures of the lovable bear feature everywhere, (although it is so unfiltered Chinese that the real name, Restaurante Xiongzai, is only displayed in Mandarin.) Don’t tell Disney! Their speciality is Sichuan, so expect spicy, or ask them to hold the chili! I always order bao; soft, pillowy steamed dumplings, stuffed with pork, lamb or cabbage. Apart from dim sum, there’s a huge selection of things on skewers, which you choose from a big cabinet. Then order some soupy noodles from the menu, or make your own selection – just pick out what you want, and they will cook it up for you in a delicious hot broth. My favourite dish is the cold noodles with peanuts and cucumber in a spicy sesame sauce; it’s really refreshing. There’s also some very popular pulled pork sandwiches, Chinese style. There has been a refurb recently and there are now more tables. Avoid the lunch crowd by coming before 14:00, when you’ll find mostly Chinese customers; a good sign. It’s also the perfect place to eat late after a movie at the nearby original version cinemas. They have a continuous menu, and it’s cheap – it’s difficult to spend more than 10€, even including drinks. They do take-away too, and on warm evenings, I love to take my noodles and eat al fresco in the nearby square.